The two gentlemen in question here were Harry Weprin (1884-1960) and Jacob Glass (1885-1962). Both were immigrants from Russia and both began life with longer surnames that were shortened for American consumption. Harry Weprin came to the U. S. in 1905/06 as Harry Weprinsky. Jacob Glass arrived in 1905 as Jacob Gluchowsky. City directories listed Harry Weprinsky, a carpenter, located at 2379 or 2381 2nd Ave, from 1909 through 1913. The New York telephone directory listed him as a carpenter/contractor at 309 East 121st St. from 1914 through 1915. He next appeared as H. Weprin, builder and general contractor, at 4925 Broadway in 1917. 4925 Broadway was the address of the Broadway Contracting Co., a partnership between Harry Weprin and Conrad Glaser. Harry Weprin registered for the World War I draft in 1918 when 34 years old, born 10 Sept. 1884, a carpenter self-employed at 2077 3rd Ave., New York. In the 1920 U. S. Census he was a building contractor, age 34, born Russia, immigrated 1906, naturalized 1912, living at 37 Vermilyea Ave., Manhattan. His son, Jack Weprin, was 10 years old, born New York. This notice of Harry Weprin's death appeared in the New York Times, 17 March 1960. Jacob Glass began his career in the U. S. as a manufacturer of ladies and infants wear. In 1921 he applied for a passport in order to return to his native town, Ekaterinoslav, Russia, in order to bring his mother to the U. S. (Ekaterinoslav is located in central Ukraine on the Dnieper River.) Jacob Glass's mother was Chassie Gluchowsky. On his passport Glass said that he was born 15 January 1885, that he immigrated to the U. S. from England 15 Feb. 1905, and that he became a naturalized citizen 25 Feb. 1913. Jacob Glass Inc., garment manufacturers, was located at 319 Grand St., Manhattan. City directories listed this business from 1915 through 1925. Meanwhile, he had joined with Harry Weprin in real estate under the business name H. & J. Realty at least as early as 1922. Jacob Glass received a short obituary notice in the New York Times, 15 Oct. 1962, reading, "Jacob A. Glass, a partner in the real-estate concern of Weprin & Glass at 1457 Broadway, died Saturday at his home, 1916 Avenue K, Brooklyn. He was 77 years old. Mr. Glass, a Mason, was treasurer of the Harry Weprin Society, a philanthropic group, and a trustee of the East Midwood Jewish Center in Brooklyn. Surviving are his widow, Mrs. Annie Meyerowitz Glass; a daughter, Mrs. Evelyn Braverman; two sons, Samuel and Carl; a sister, Mrs. Bessie Berger, and six grandchildren." Harry Weprin's partner at the Broadway Contracting Co. around 1917-1919 was Conrad Glaser (1888-1969). (Was he another Gluchowsky?) In the 1920 U. S. Census Glaser and Weprin both lived at 37 Vermilyea Ave. in uptown Manhattan. Glaser is known for constructing 307 5th Ave. near 31st St. (For more on 307 5th Ave, see daytoninmanhattan.blogspot.com.) Harry Weprin was also involved here: "The seventeen-story office and showroom building at 307 Fifth Avenue, adjoining the northeast corner of Thirty-first Street, has been sold by the 307 Fifth Avenue Corporation, representing Conrad Glaser, builder, it was learned yesterday. Mr. Glaser completed the building early this year and has sold it to the Boulder Realty Corporation, Harry Weprin, president..." (New York Times, 25 July 1929, pg. 49) This ad for Conrad Court on Academy St. near Vermilyea Ave. appeared in the New York Times, September 1922. Harry Weprin's son, Jack R. Weprin (1909-1974), followed him into Weprin & Glass, real estate. Weprin & Glass ran this ad for sale or lease of a recently constructed garage on East 55th Street in the New York Times, 18 March 1926. 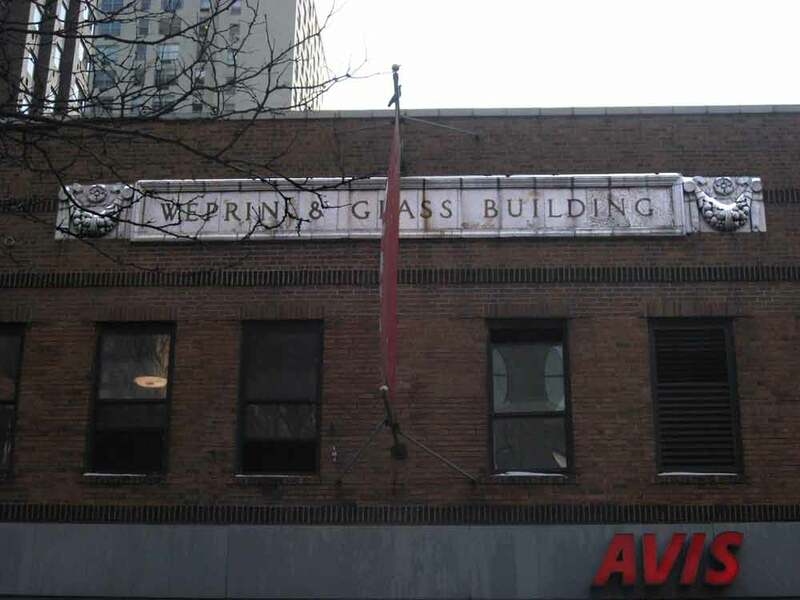 Another Weprin & Glass inscription is found on a garage at the corner of 3rd Ave. and 111th Street, Manhattan. Metrohistory.com indicates this 2-story brick stores and garage at 2013-2017 3rd Ave. was built in 1923. The owner was H. & J. Realty Corporation.